, by Shipman, James; Wilson, Jerry D.; Higgins, Charles A. 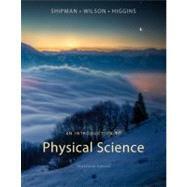 Consistent with previous editions of An Introduction to Physical Science, the goal of the new Thirteenth edition is to stimulate students' interest in and gain knowledge of the physical sciences. Presenting content in such a way that students develop the critical reasoning and problem-solving skills that are needed in an ever-changing technological world, the authors emphasize fundamental concepts as they progress through the five divisions of physical sciences: physics, chemistry, astronomy, meteorology, and geology. Ideal for a non-science majors course, topics are treated both descriptively and quantitatively, providing instructors the flexibility to emphasize an approach that works best for their students. Featuring the same content and coverage as the full text along with our integrated digital homework solution, Enhanced WebAssign with the Cengage YouBook, the Hybrid version offers unparalleled value. Now your students can have a more interactive learning experience, with the convenience of a text that is both brief and affordable. Cengage YouBook offers instructors the easiest means to quickly personalize course materials, including embedding videos, original material, and section level customization.